Standalone blue laser heads. The PLH3D series is designed for industrial, services, and hobby applications, especially for laser engraving. Our laser heads are standing out by small dimensions, long life, solid and user-friendly design as well as resistance to pollution and damage. 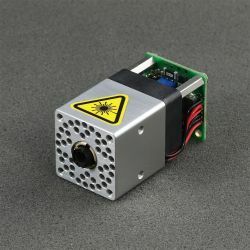 6 W laser head can be mounted to any CNC router or another CNC machine. The compact PLH3D-2W engraving laser head can be installed in almost any 3D printer. PLH3D series engraving laser heads are designed for materials such as wood, plywood, balsa, cardboard, paper, leather, rubber, plastics, including foams. Also, the blue laser works well at marking stainless steel and titanium. Check out our complete sets for X-Carve and Stepcraft machines and other CNC accessories for PLH3D series. PLH3D series is a superior selection for laser wood engraver. With the high absorption, the ability to regulate beam power and spot size, our CNC laser allows you to achieve interesting and varied effects for wood engraving. In our blue laser head, we have also implemented solutions that allow it effectively to remove smoke during operation. Also, the laser engraving head is easy to clean after work. We pay special attention to make our product the best laser engraver for your home CNC machine.